NEW Black Red Flames ABS Bodywork for Kawasaki. Why choose CaliBikerClub Fairings? At CaliBikerClub, we take care of our customers. We are based in California, United States, and we offer service of high standards. Our fairing kits: are GUARANTEED to fit your model, are made of high quality ABS that meets or exceeds OEM standards, and are painted with a long-lasting, durable finish. Our fairing sets go through TOP quality control procedures where each piece is individually inspected to ensure top quality. And if there are ANY issues, we will work with our customers to resolve it. All main pieces and trim included as shown. Gas Tank Cover and Seat Cowl not included. Quality paint job: Long-lasting and durable finish. Each painted fairing set is made FRESH to the order. Up to 3 layers of clear coat. Trim pieces come unpainted. Strong, durable, and flexible ABS: Material meets or exceeds OEM material. Each piece machine-made by injection technology based off OEM standards. Holes and tabs are part of the mold and align to factory settings (not drilled or glued-on). Manufactured Process: Guaranteed BEST fitment in the industry. Fairing pieces created through ABS INJECTION MOLDED Technology. Each piece individually wet sanded until smooth. Coat of primer added to each new ABS piece. Paint applied through double paint process for best quality. Paint dried in high heat oven to bond primer. Minimum of 2 layers of clear coat (gloss) applied, extra layer added if needed or requested. Powered through UV machine in between each clear coat for hardening. Checked by Quality Control Department for PERFECT accuracy. Ships factory direct overseas. Our fairing sets go through a quality control procedure. Each fairing piece is inspected to ensure top quality standards. Contact our team with any questions or concerns and we are more than willing to help. THIS LISTING INCLUDES PROFESSIONAL-GRADE FIBERGLASS HEAT SHIELD TO PROTECT FAIRINGS FROM WARPING/MELTING! Painted FRESH to the order through TOP quality control procedures. Guaranteed to fit your model. Important Note: These are not genuine Kawasaki products. These are aftermarket ABS fairings that are not manufactured by Kawasaki. Any Kawasaki logos are trademarks of Kawasaki and are for display purposes only. Any race replica logos are trademarks of their respective owners and appear for display purposes. All main pieces and trim included as shown (Gas Tank Cover and Seat Cowl not included). ALL our fairing kits come with Professional Grade Fiberglass Heat Shield. (protects your fairings from melting/warping). Check Out Our Fairing Bolt Kits. 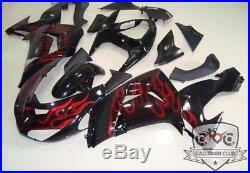 Fiberglass fairings, licensed decals, & other parts available. Product guaranteed to fit your model. Item must be in new, unused, unmounted condition. The item “Black Red Flames Fairing Set Body Kit Bodywork fit Kawasaki ZX10 ZX10R 2006-2007″ is in sale since Thursday, February 8, 2018. This item is in the category “eBay Motors\Parts & Accessories\Motorcycle Parts\Body & Frame\Fairings & Body Work”. The seller is “calibikerclub” and is located in Orange, California. This item can be shipped to North, South, or Latin America, all countries in Europe, all countries in continental Asia, Australia.